« Hold the Press – Nelson seen on farm before 9am!! 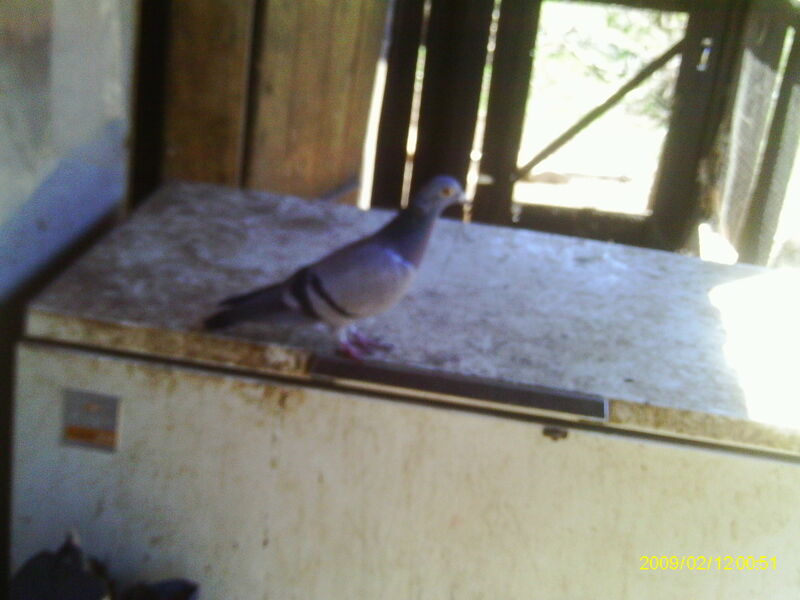 Firstly, a sad lament for our last pigeon who escaped and went searching for a new mate earlier this week. I hope he finds one. 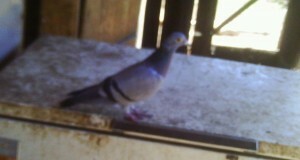 Our other pigeons were taken one by one by what we think we identified as an Egyptian Mongoose about 6 weeks ago. This one survived because Jeroen caught the murdering beastie in the act. It’s never been back and we’ve resecured the space, but we’d decided to upgrade the pigeons’ nestboxes before we bought new pigeons. I guess Mr Pigeon couldn’t wait that long. I gave away a pregnant doe rabbit at the weekend, a fair exchange for a couple of kittens I think. The kittens have yet to be born, so I’ve a while yet to persuade Jeroen of the sense of this new additional to the menagerie which I have to admit that he’s not entirely convinced of yet. One less breeding doe is a good thing though as it leaves us one per hutch. I have four pregnant does just now, so shortly we should be over run with rabbits again. The ducks and chickens are really enjoying their new run. They have stopped making a mad dash for the outside door each time I open it, which makes me think they’re happy with their space. We’ve been really busy in the garden this week so they’ve been overwhelmed with good green things to eat and have a good dig in (or in the case of the ducks, to poo on). The new run is roofed, with the late pigeons in mind of course. We’ll buy more, but I can’t help dreaming of pheasants. There are some in the village with the most astonishing tails and I’ve fancied some ever since I saw them. Now that we have a more open space for me to experiment in I have tried to create a maggot source for the chickens. I’ve bashed some holes in the bottom of a bucket, put thin sticks on the bottom, a pile of dead stuff in the middle and some straw on the top to act as ‘soak’ (think compost toilet, soak reduces smell). It’s hung on the now redundant pigeon roost, and the idea is that the local fly population will lay their eggs in the dead stuff. Maggots will appear, but they will hopefully exit the bucket via the holes before they have a chance to mature into more flies, falling straight into the path of grateful chickens. It’s something I’ve fancied doing since I first read about it, so I’m interested to see if it works. I don’t think I’ve actually got enough dead stuff in there at the moment as one of the cats pinched some of my dead rat supply before I could get them in the bucket (at least, I’m assuming it was a cat …). If it looks like it might be an idea worth pursuing I’ll be adding roadkill to the list of things I’m scavenging for by the roadsides! The ducks are looking a very attractive size for a roast now. I’ll have to invent a special occasion as an excuse. Other than making an unbelievable mess they have been astonishingly easy to look after and are endlessly fascinating to watch. I quite fancy getting some with eggs in mind next. The goats are causing me real worries though. The arrival of little Assado, three and a half weeks old now, has really upset the herd dynamic. The two younger goats bully Assado mercilessly if left alone with him (my only experiment lead to my having to rescue him as I thought the horned one was going to kill him), but Horny (Assado’s Mum) bullies them back to the extent that she’s developing a bald patch on her nose from all the headbutting she’s doing, The two young goats were spending night after night actually on top of the food in the manger to stay out of her space. Although they’ve stopped that now, they’re obviously unhappy about being in her presence and they’re thinner than I’d like. I’m giving them a grain ration they wouldn’t normally have, but the best solution seems to be to find a way to separate them at night. Assado is coming on really well, despite growing up as part of a dysfunctional family! He seems to prefer his grandmother to his mother but no surprises there, bearing in mind that his mother is the world’s most obnoxious goat! He’s now eating green food including, most frustratingly, the young buds of the fruit trees and our veggies. His days of being a fully free range kid are numbered, I fear. We met up with a bunch of friends on Saturday and around the time when most gatherings would be cracking open another box of wine and getting down to some good chatting half of us were getting organised to go home. It’s not that we’re a particularly sad bunch of early nighters, but we had to get back for our goats. 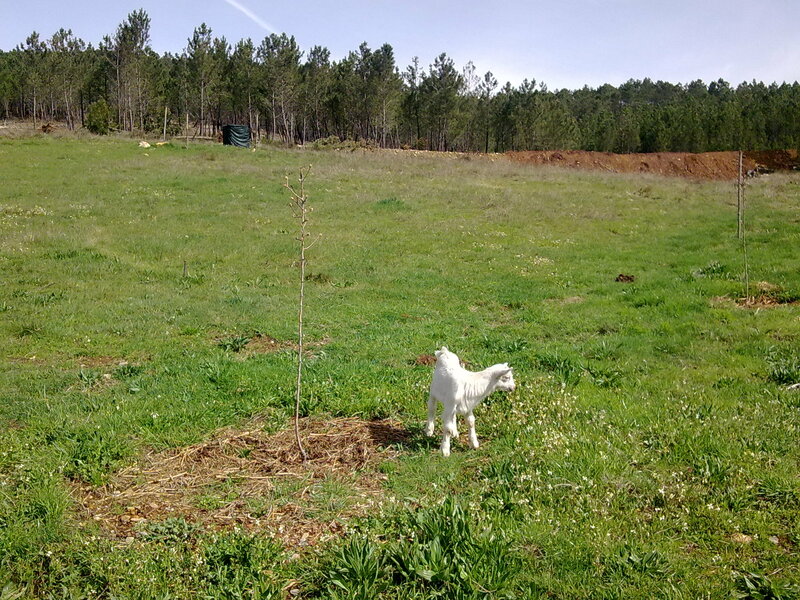 Chickens and rabbits can manage for a few hours, the dogs will whine but survive, but you just can’t leave goats unattended for very long. Not if you want to find your home and garden intact on your return anyway! It made me think again about the huge role that goats play in our lives, and if I’m honest, whether it’s worth it. My Man checks his sheep, ponies and dogs every morning and evening. As he says, farmers don’t do holidays! Absolutely not! I’m milking three times a day at the moment, so no chance to get away. I’ve always fancied goats but thought they’d be fairly self sufficient, sounds like they’re way too high maintenance for me! They are the most frustrating animals I have ever encountered!